In addition, we’ve also included ExitPath’s proven Press Releases, a strategic outline of key elements for a successful PR program, and a quick thumbnail page of a technology press selection, as a working example you can use. IdeaBrowser – More than 10,985,690 words, phrases, quotes, definitions and over 3,000,000 keyword-tagged images updated with 12,000 to 15,000 related terms per week to provide creative fuel. Topics Browser – Thousands of Expert Questions guide you, and help you quickly drill down to the answers you need. In addition, RichContent, one of the leading online rich media submission portals, has graciously provided a free media broadcast package (value up to $499) to help accelerate your next press release or promotional media release. By using the RichContent package, you can quickly and very inexpensively double your visibility and placement Search Engine Result Pages (SERP)… and find yourself in top Universal Search ranking on the search engines as a result (RichContent has exclusive technologies that allow you unrivaled access to the web’s most powerful search engine directories. Your press release, and other promotional media, have the potential to be seen by hundreds of thousands of readers, and thousands of editors and press people looking for the new-new thing). 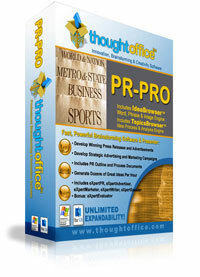 What Makes ThoughtOffice PR|Pro So Powerful? • Years of expertise in the world’s most popular brainstorming, creativity, promotion and writing software. It’s like having the finest PR experts in the world on your team, helping you compose, fix and position your message just like a PRO. • A 10,985,690 word / phrase / image and colloquialism database that creates over 55 million associations for crafting the perfect headline, sentence and body copy of your press, advertisements and other media. Your most potent form of exposure is in the media. Whether you’re raising money, or working to raise your profile so that clients and customers are asking to see you, PR is one of your most effective vehicles. In fact, we’ve seen companies receive funding and become wildly successful as the result of a single PR strategy executed well over a 90 day span. We’ve personally generated millions of dollars for our own businesses and others as a result of well placed press releases, articles and interviews. This is not some POTENTIAL opportunity to gain success in your business. This is the real thing. Public Relations is the driving force for Fortune 500 firms… and your competitor down the street. Either you have the story, or they do. And with PR|Pro, you have the upper hand. And, when you’re developing market channel (resellers, retailers, distributors, etc.) there is no better demand generator then a push-pull marketing program led by regular PR efforts. As a process-driven business, ExitPath has developed specific methods to ensure that you know how to tie-in marketing and sales programs, and by developing sequential releases and events, you create and sustain momentum. Some quick outlines and process documents, as well as sample press releases are included in the package, to help you quickly get up to speed on what it takes to win the PR game. We are offering you ThoughtOffice PR|Pro at a dramatic discount: for 30% off the price normally offered to media professionals and corporations. Why? Because we firmly believe that good PR will change you and your business in a great way. It beats paid advertising, and drives business both on and off the web, making measurable, long-term improvement on your company’s bottom line. And if you lean into the RichContent component of this offer, you’ll find that it beats your current Pay Per Click programs and many of your more costly web marketing promotions hands-down. (And we have the stats to prove it). You win: with new business, thousands of new visitors to your web site, improved search engine ranking, and the inevitable sales. RichContent wins because you get to sample their services in such a way that you can see the difference in results from different types of media accounts… and how first page placement can drive tens of thousands of new visitors over later pages. ThoughtOffice wins because you get to use this unique, proven software solutions to craft your PR… and maybe even come back and purchase additional Expansion Modules to help you craft a business plan, write a story, or develop a grant. Whatever it is you need to write for your business, ThoughtOffice probably has a solution. So… are you next? Would a killer headline, snappy copywriting and an effective offer, in front of over a million eyeballs a month make a difference in your business? Find out now. And learn the secret that 492 of the Fortune 500 know about crafting PR: ThoughtOffice and RichContent make it easy, powerful, and affordable. • ThoughtOffice Software, with the integrated and expandable module base, and IdeaBrowser – the word and phrase association database engine. • Expert Writer Module, with over 400 questions in 8 categories. • Expert PR Module, with over 300 enveloping questions that surround, expose and then create your advertising message. 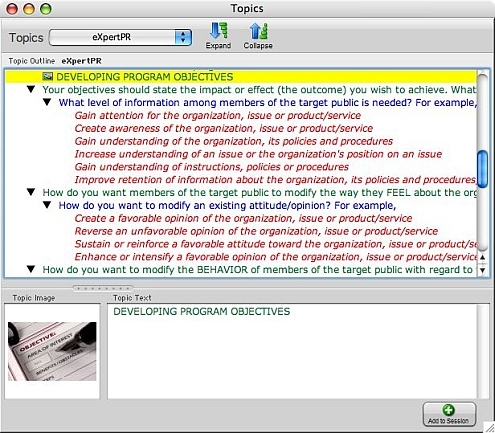 You also receive ExitPath’s PR Outline and PR Process documents, to help you clarify and develop the core components of a perfect online and offline PR program. 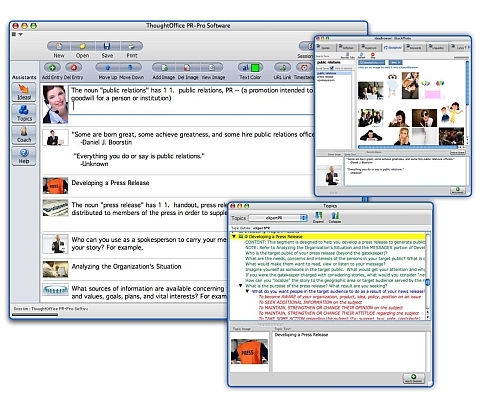 This resource has been developed over 16 years, in the field, developing winning PR programs for everyone from high-tech to architectural and environmental concerns to Trikke scooters and eAgency wireless technology solutions. In addition, we include samples of winning press releases that have receive hundreds of thousands of views online, and have been picked-up and printed in People, Time, Popular Science, Internet Week, eTrade News, Microsoft Press, Wall Street Journal and hundreds of well-known periodicals. For more information about ThoughtOffice software, download our FREE Introduction to ThoughtOffice PDF. ThoughtOffice has a 49-day, 100% guarantee. Your satisfaction totally guaranteed. We’re here to personally help you with the program, and use it effectively to develop lots of great new ideas – faster and more creatively. We’ll help you turn those ideas into valuable products & services, or we’ll update, upgrade, coach or refund to your complete satisfaction. Get Free Creativity Tips and More!